After our escapades in the grimy underbelly of Cadwallon last week it’s time for something a little more peaceful. In this week’s edition of Friday Night Unplugged we’re checking out two simple to learn but difficult to master games from board game publishers Calliope Games – Tsuro: the Game of the Path and its Kickstarter-born sequel Tsuro of the Seas. I’m joined again by Josh and, marking her first entry to the column, Fi. The three of us make the core of our group and hopefully will continue to do so throughout this column. Published back in 2004 to small publisher Wizkids, Tsuro: The Game of the Path now it finds itself under the mantle of family game specialists Calliope. 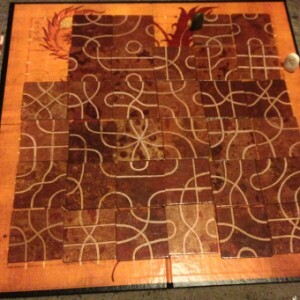 Tsuro: the Game of the Path has been a favourite of my game group for a long time. Its blend of puzzle and competitive gameplay makes it an interesting experience to play. The best part is, it follows an easy-to-learn set of rules. Players start on path markers around the edge of the board. Players place a path tile. Path tiles have 4 paths in different patterns across the piece. They then move their piece along the path connected to their tile. Lastly they draw the hand back up to 3 tiles and the next player makes their move. If your path takes you off the board, you’re out the game. If your path directly joins someone else’s path, you’re out the game. The last person on the board wins. It’s that simple, at least in practice. Let’s get started then. Poised and ready to go, I take up my position on the edge of the board. Having shuffled the tiles, chosen our coloured pieces and dealt three tiles, each play starts with eldest player. Fi reluctantly goes first and we place our pieces on the edge of the board. The first half of the game goes relatively smoothly, with enough room around the edge of the board that 3 players can move around comfortably in the early game. The fun starts when Fi and Josh find themselves leading into the same tile. The rules state that if a path connects to yours you must follow it so both pieces will move on Fi’s turn. Sadly the only possible move Fi could make took her off the board, leaving Josh safely on the board. It was now a 2 player race, neither of us sure if we could stay on the board until the tiles ran out. The more tiles laid down the fewer safe routes existed. Managing to stay on the board and running out of options the game finished with Josh being sent off the board and me standing victoriously. That didn’t take long, which is one of the virtues of Tsuro. Games generally last for 15-20 minutes depending on the number of players. With Solitaire rules available online that could be anywhere from 1-6 players, of course higher player numbers mean it doesn’t take as long for people to start going off the board. 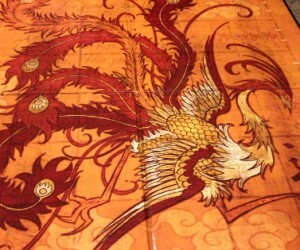 One of the things that we all agreed on is that Tsuro is one of those sets you want to hang on the wall. The artwork is beautiful, the tiles are sturdy and well made and even the rulebook itself is a fold-out full-colour affair adorned with the Asian themeing of the entire set. 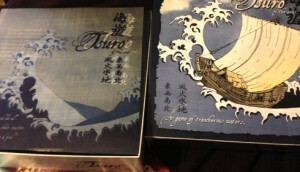 To top it all off, on opening the box the first thing you see is a rice paper-style print of the box art. The Artwork is one of Tsuro’s major draws. From the simple rules to the gorgeous production Tsuro: the Game of the Path had us hooked from the start. In essence it is an icebreaker game. Perfect for the start of an evening, light hearted but still fiendishly competitive, it’s great to get people talking. However after a few games its simplicity stands against it. It feels like there could be more to the game without ruining the flow. That is where Tsuro of the Seas comes in. Tsuro of the Seas is a child of Kickstarter passing its $15,000 funding goal and eventually finishing with $48,813 pledged. It is now available online and at most tabletop retailers. 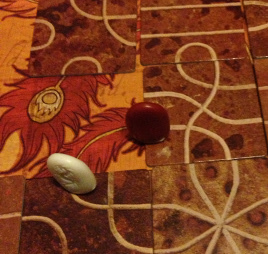 The essence of Tsuro is still the same: place tiles then move around the board be the last one standing. However there are monsters lurking in the sea, the monstrous Daikaijiu. Their placement and movement is defined by rolls on a pair of dice. 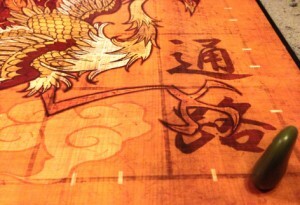 At the beginning of the game a number of Daikaijiu are placed on the board depending on players. 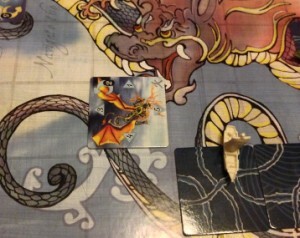 At the start of each turn both dice are rolled, a 6,7 or 8 activates the Daikaijiu movement. Players then roll a single die. The number on the die dictates which way each piece moves in the direction indicated by the matching number on their tile. A roll of 6 places a new piece. Daikaijiu tiles that move onto player tiles destroy the tile and any player pieces on it. Player pieces cannot move onto Daikaijiu tiles unless it’s their only move available. Doing so removes their piece from the game. As this was another 3 player game, we started with 6 Daikaijiu tiles on the board. Other than that, setup is identical to the original Tsuro. By some small mercy they all ended up bunched up on one side of the board, giving the 3 of us plenty of space to avoid them, at least for a few rounds. That didn’t last long. 2 turns of bad rolling saw me destroyed by a stray sea monster. Then fate intervened. Josh and Fi yet again shared a tile however an unlucky roll by Fi created a new Daikaijiu tile. This would have been easy to deal with if, when rolling for its location, the dice hadn’t shown an ominous 5 and 5: the same tile the pair were currently occupying. Finishing the game there, nobody was left alive. Your board will probably be tidier, after being eaten by the Daikaijiu nobody cared about tile neatness. Nothing here is too dissimilar to the original Tsuro. The only difference we can think of is that the inclusion of the Daikaijiu tiles does extended the gametime a little. While the box says 20-40 minutes, after a few playthroughs we are yet to see a game that did take this long. I’d say it’s more 20-30 minutes with 40 being a very rare extended game. 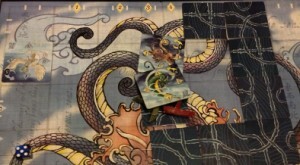 Tsuro of the Seas features the same high quality production as its predecessor. The art on the Daikaijiu tiles certainly maintains the bar. If anything Tsuro of the Seas contains more theme. The instruction booklet sets the story of the emperor’s fleet of Imperial Red Seal Ships, sent out to discover the secrets of the ocean and spread the name of the emperor. One of the group’s favourite part were the ship models themselves; while plastic, they were detailed and provided the finishing touches to the Tsuro style. The Tsuro series is one of the first games I would advise for anyone looking to play a game with the whole family. While it remains competitive, the atmosphere it creates is light, fun and perfect for starting or ending an evening of gaming. Although the original Tsuro: the Game of the Path has been part of our tabletop staples for a long time, I feel like Tsuro of the Seas is the better option for anyone looking to pick up this set. The inclusion of the Daikaijiu adds a nice random element to the gameplay for anyone looking to spice things up again and there are enough Wake tiles to play a normal game of Tsuro without the Daikaijiu included. We all loved it and we’re damn sure you will too. Next week we’re journeying where no man has gone before as we checkout a rather interesting re-theme of a tabletop classic. It’s time to explore the regions of space, in Star Trek: Catan. Aye, good game with a succinct and accurate review. Lewis thrives on pressure and life just isn’t exciting enough for him. That might be why he games so much. Despite being an avid gamer and writer he has never finished a Sonic game past the first world and has accepted the fact he probably never will. Lewis writes words for those that want them.